e-RSVP.co.uk - Create events, send guest invites & monitor replies. How it Works page. A free service, e-RSVP enables you to create events, generate guestlists and send email invitations using your own home page within the website. Each guest is issued an e-PIN which is included when sending each invitation. Guests use this e-PIN to e-RSVP - letting you know whether they are coming or not, or if they have any message for the host! 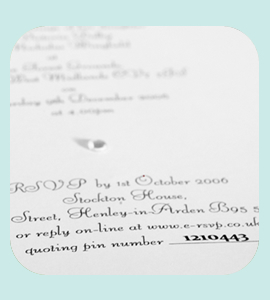 e-RSVP also lets you post information for your guests, such as an itinerary or a more detailed description of events - perfect if you are planning on surprising them, and don't want to give too much away before the event! Click here to Register and set up your first guestlist! N.B. your guests do not have to register to use the service.